Landsat image mosaics over the conterminous United States created using Landsat 8 Level-1 data (left) and Landsat 8 Surface Reflectance data (right). Images were created in December 2014. Landsat 4-5 TM and Landsat 7 ETM+ data are processed to Surface Reflectance using the Landsat Ecosystem Disturbance Adaptive Processing System (LEDAPS), a specialized software originally developed through a National Aeronautics and Space Administration (NASA) Making Earth System Data Records for Use in Research Environments (MEaSUREs) grant by NASA Goddard Space Flight Center (GSFC) and the University of Maryland (Masek et al., 2006). The software applies Moderate Resolution Imaging Spectroradiometer (MODIS) atmospheric correction routines to Level-1 data products. Water vapor, ozone, geopotential height, aerosol optical thickness, and digital elevation are input with Landsat data to the Second Simulation of a Satellite Signal in the Solar Spectrum (6S) radiative transfer models to generate top of atmosphere (TOA) reflectance, surface reflectance, TOA brightness temperature, and masks for clouds, cloud shadows, adjacent clouds, land, and water. The Landsat 4-7 Surface Reflectance Product Guide contains details about the LEDAPS algorithm and the Surface Reflectance data products created from it. Landsat 8 OLI SR are generated using the Landsat Surface Reflectance Code (LaSRC), which makes use of the coastal aerosol band to perform aerosol inversion tests, uses auxiliary climate data from MODIS, and uses a unique radiative transfer model. (Vermote et al., 2016). LaSRC hardcodes the view zenith angle to “0”, and the solar zenith and view zenith angles are used for calculations as part of the atmospheric correction. The Landsat 8 Surface Reflectance Code (LaSRC) Product Guide contains details about the LaSRC algorithm and the Surface Reflectance data products created from it. While both the LEDAPS and LaSRC algorithms produce similar SR products, the inputs and methods to do so differ between them. The table below displays each alrogrithm. View zenith angle From input metadata Hard-coded to "0"
1. Due to missing auxiliary input data and/or necessary thermal data, Surface Reflectance processing cannot be applied to data acquired during the dates listed below. * Landsat 8 thermal data needed to produce Surface Reflectance data is unavailable. ** Auxiliary data needed to produce Surface Reflectance data is unavailable. 2. The efficacy of land surface reflectance correction is likely to be reduced in hyper-arid or snow-covered regions, areas with low sun angle conditions, coastal regions where land area is small, relative to adjacent water, or areas with extensive cloud contamination. Corrections may not be accurate to data acquired over high latitudes (> 65 degrees North or South). Landsat 7 ETM+ inputs are not gap-filled in the surface reflectance production. Users can refer to the Quality Assessment(QA) band for pixel-level condition and validity flags. 3. Landsat atmospheric correction and surface reflectance retrieval algorithms are not ideal for water bodies due to the inherently low level of water leaving radiance, and the consequential very low signal to noise ratio. Similarly, surface reflectance values greater than 1.0 can be encountered over bright targets such as snow and playas. These are known computational artifacts in the Landsat surface reflectance products. Quantitative remote sensing retrievals of water column constituents requires different algorithms, which are being considered for integration into future Landsat surface reflectance products. Scene-based Surface Reflectance data (on-demand): Processing requests for scene-based Landsat Surface Reflectance data can be submitted from EarthExplorer. The data are located under the Landsat category, Landsat Collection 1 Level-2 (On-Demand)subcategory, with Landsat 8, Landsat 7, and Landsat 4-5 TM listed as individual datasets. These requests are sent to the ESPA On-Demand Interface for processing and data delivery. The USGS Earth Resources Observation and Science (EROS) Center Science Processing Architecture (ESPA) On Demand Interface (ESPA) can also be used to submit lists of Landsat Level-1 scenes or granules from select MODIS collections to request Level-2 Surface Reflectance processing, Surface Reflectance-based spectral indices, customize output options, and request output product statistics and plots. Tile-based Surface Reflectance data: Tile-based Surface Reflectance data are available for immediate download; the data are located under the Landsat category, Landsat Analysis Ready Data (ARD) subcategory, and listed as U.S. Landsat 4-8 ARD. Visit the Landsat Data Access web page for information about bulk download options. Data manipulation tools that function with Moderate Resolution Imaging Spectroradiometer (MODIS) Land products are likely to work with Landsat surface reflectance data products as well. The public domain tools listed below are suggested for format conversion, science data set extraction, bit extraction (for top of atmosphere reflectance, saturation values only), and reprojection. HDF-EOS To GeoTIFF Conversion Tool (HEG): Allows a user to reformat, re-project and perform stitching/mosaicing and subsetting operations on HDF-EOS objects. It can also reformats and re-project some SMAP, VIIRS and SRTM products. The output GeoTIFF file is ingestible into commonly used GIS applications. HEG will also write to HDF-EOS Grid & SWATH formats (i.e for Subsetting purposes) and native (or raw) binary. Landsat Quality Assessment (QA) Tools: Developed by the MODIS land quality assessment group to work specifically with Landsat Surface Reflectance data. The Landsat 4-7 Surface Reflectance Code LEDAPS Product Guide describes the LEDAPS algorithm and the Surface Reflectance data products created from it. The Landsat 8 Surface Reflectance Code (LaSRC) Product Guide describes the LaSRC algorithm and the Surface Reflectance data products created from it. 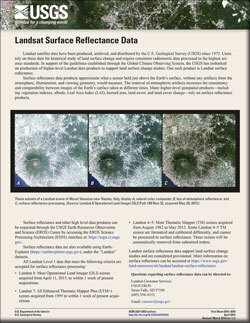 Visit the Landsat Surface Reflectance page for more information. The USGS Earth Resources Observation and Science (EROS) Center Science Processing Architecture (ESPA) On Demand Interface is used to request processing and services for Landsat Science Products and some MODIS archives.